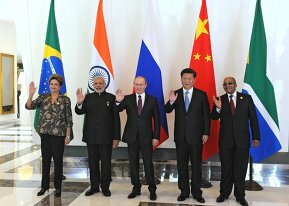 An informal meeting of BRICS leaders (Brazil, Russia, India, China and South Africa) was held on the sidelines of the G20 summit. In his speech, Russian President Vladimir Putin said that the BRICS countries significantly contribute to expanding international trade, industrial and technological cooperation. He stressed that the G20 summit's agenda is in line with BRICS priority issues. 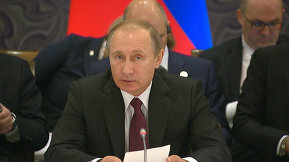 The Russian President also said that BRICS member states, as well as G20 countries, are very much focused on counter-terrorism issues. It is a pleasure to greet the BRICS leaders here at our traditional meeting on the sidelines of the G20 summit. This is a good opportunity for us to discuss and coordinate our approaches on key issues on the G20 agenda, review implementation of the agreements we reached at the BRICS countries' July summit in Ufa, and map the directions for our future work. Our countries make a big contribution to developing global trade and industrial and technological cooperation. It is fitting that the G20 summit agenda ties in well with the issues the BRICS countries see as priorities for their work. These priorities include developing a genuinely open global economy, expanding and diversifying trade, transport, and technology exchanges, and reforming the global financial and currency system, including by giving the developing countries a bigger role in the IMF. The Economic Partnership Strategy through to 2020, which the BRICS countries adopted at the summit in Ufa, aims to achieve precisely these objectives. I believe that this strategy's comprehensive implementation will strengthen the BRICS economies' complementarity, and enable us to make broader use of common resources and reserves to increase goods and investment flows. The full-format launch of the BRICS Development Bank and the Reserve Currency Pool with total funds of $200 billion will help to make the global financial system more effective and reliable. These new institutes will enable our group to carry out big strategically important cooperation programmes independently. The Development Bank is making an active selection of technology and infrastructure projects and will start financing them very soon. The five BRICS countries are working closely in other areas too. This year, we began our common cooperation efforts on energy efficiency, information security, and migration. We are developing our cooperation in science, culture, and education. Our countries are developing their inter-parliamentary ties, and contracts between trade unions, youth movements, and civil society. The issues on the G20 agenda today include cooperation in fighting terrorism and resolving the refugee issue. The BRICS countries give these issues their utmost attention in their close foreign policy coordination. We are very much aware that we can combat the terrorist threat and help millions of people who have lost their homes only if the entire international community unites its efforts. As for the terrorist threat, we all saw the horror of what happened just recently in Paris. Our sympathy goes out to all who were affected by these attacks, but we continue to call for a common effort in order to fight the terrorist threat effectively. At the same time, we must act in strict accordance with the United Nations Charter, follow international law, and respect each country's sovereign rights and lawful interests. These basic principles were reflected in the Ufa Declaration the BRICS countries adopted at their summit this year. 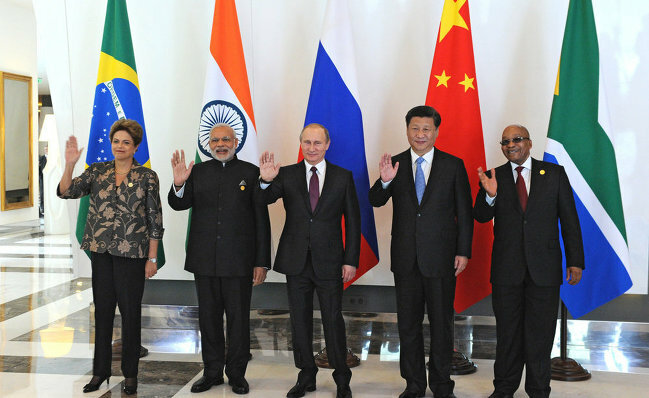 Next year, India will take over the helm of the BRICS group, and China will preside in the G20. I want to wish our Indian and Chinese friends success in this work and say that you can always count on our active help and support, and I am sure the same goes for all of the BRICS partners.